For every Despotic and Mother of God feast we have great joy no matter where we celebrate. But in the Holy Land everything is more real. There you feel like you are flying in the clouds. Sometimes you don't realize what is happening to yourself, whether you are in heaven or on earth. And this doesn't only happen to me, but to everyone who gathers for these feasts. Together with the touching of the Holy Light one of the greatest feasts is the Transfiguration of the Savior. On Mount Tabor on August 6/19 there appears the invisible wonder alongside this feast which cannot be seen in any church throughout the world unless God grants a personal revelation. There, on the night of August 18th towards August 19th during the Divine Liturgy in front of thousands of faithful and non-believers there descends on this sacred mountain a cloud. Non-believers - as I have heard from many of them - say that it is a meteorological phenomenon. This cloud however is very different from other more familiar clouds which descend in the morning on our mountains. As the vigil begins one sees on the top of the mountain, towards Nazareth, something orange in the darkness of the night. This moves perpendicularly towards the church and stands there like an orange tongue until twelve o' clock or one o' clock at a great distance from Mount Tabor. When the Divine Liturgy begins, especially at the time of the Cherubic Hymn, the cloud comes towards the mountain and begins to take various shapes, and then oblong pieces cut from the cloud and take the shape of birds or angels and come upon the dome of the church. There it is, as well as the other buildings in the area, and the people go up and invoke the Holy Spirit. Words are poor to describe what you feel when these pieces, which are soft like cotton, come and you touch them with your hands, and you feel them on your face. You feel as if you want to climb onto this piece and go away and not care about anything. Simultaneously with this miracle an exquisite scent like incense spreads in the air but it is not incense, like resin but it is not resin. It is a combination of oriental conifers and incense. Naturally there are those who doubt by saying that it is a trick of the Greeks, or that is a meteorological phenomenon. But this is a general event of joy, something which does not occur on other mountains under any meteorological condition. Of course when descending from Mount Tabor, after the vigil, with the Greeks, Arabs, Bulgarians, Russians and Romanians chanting "You were transfigured on the Mount Christ God", you do not desire anything worldly but to live eternally like this. In this instance, as with the Holy Light, these miracles, this consolation, God gives in the end for those who believe, because as the Bible says: "I came to give to those who have, and to take from those who do not have". So God takes from those who have little faith and start to question God, His presence and actions in this world. But for those who say: "I Believe Lord, help my unbelief", He reveals the greatest joy. 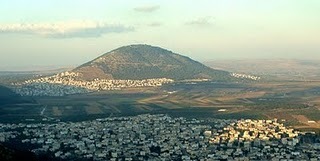 Indeed, there on Mount Tabor you understand why the Apostle Peter told Christ that he didn't want to leave that place. Truly you do not want to leave Tabor. All worldly events pale before what is taking place on Mount Tabor. P.S. On Mount Tabor, of the three churches only one is Orthodox [Greek]. From the testimonies of eyewitnesses the bright cloud descends only on the Orthodox Church.